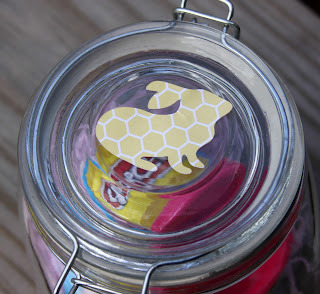 I created these simple Easter gifts with a jar from the Dollar Tree. I filled it with two Easter related cookie cutters that came in a four pack for a dollar at Target, some Easter Grass and a small sized Play-Doh. Then I added a simple bunny out of card stock to the top that I cut out on my silhouette machine. I was able to make three small gifts for around $7 total. I hope these little jars are a hit with the little tykes getting them. I can't imagine why they wouldn't be! Who doesn't love playdough?!! How fun! Oh, that is adorable. I love the bunny on the top, such a YOU touch. So great- cute- hopping up and down on this one! Great idea! This would make someone very hOppy!! Oh, I love gifts that have multiple uses! 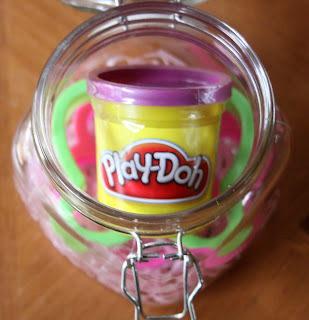 You can easily use this jar for something fun afterward. Thanks for sharing such lovely ideas each week! I enjoy them all! Great idea, Megan! I haven't met a kid who doesn't love Play Doh! Cute bunny! What a cute idea Megan! I love it! These are just adorable - what a great idea instead of all the candy! I'm pinning this to my Easter board. Smart idea! Love the jars! Hi! Followed you over from Whimsey Wed blog hop. These are so cute! Following via GFC and FB. Adorable!! My kids would just love getting this for Easter. We are starting a link up party on Thursdays (today:), and we would love for you to join us with this post and/or any others you would like to include. We are at allthingswithpurpose.com. Hope to see you there!! What a cute idea! I love that it also isn't more candy. Very cute gift idea Megan! Great idea for Easter. Thanks so much for sharing it at Romance on a dime! !